The Light Task Plus 5™ is a high performance cut resistant glove that gives up nothing in wearer comfort, making it ideal for applications requiring a high level of protection from cut hazards combined with a high degree of dexterity and feel. A highly advanced seamless liner contains Dyneema® yarn that is cool, stretchy and amazingly light. It also contains glass fiber for enhanced cut resistance up to ANSI cut level 3 and EN388 cut level 5. The bi-polymer coating is a blend that combines the best properties of nitrile and PU (polyurethane) to provide a surface that is mechanically tough, grippy and flexible. Black and dark blue colors hide grime, making this glove a highly practical choice for the dirtiest of jobs. The glove is also fully launderable for extended use. The back of the glove is un-coated, for ventilation and comfort. Dyneema® provides a cool and stretchy feel. Dyneema®/fiberglass blend provides ANSI level 3 and EN level 5 cut resistance. Seamless liner is surprisingly light-weight, stretchy and form fitting for comfort and reduced hand fatigue. Combines the mechanical toughness of PU with the grip and flexibility of nitrile. Contains no reaction causing natural rubber proteins. Available in sizes 7S to 11XXL to comfortably fit a wide range of users. For easy sorting after laundering. 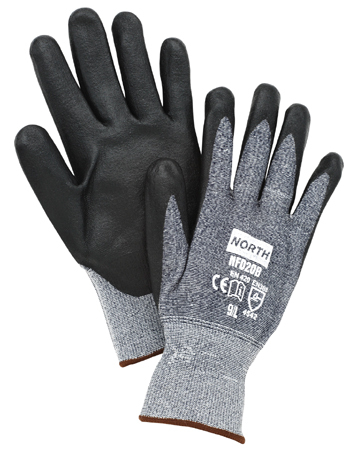 For more information on the NorthFlex™ Light Task Plus 5™ glove, please contact North Safety Products at 888-422-3698 or marketing@northsafety.com.